Keep your skin well protected with our best quality rash guard that repels moisture and prevents cuts, scrapes and skin irritations. The Shield rash guard is engineered with abrasion free, Hydro wicking technology so you can power through the most demanding training sessions and competitions. Comprised of high-tech compression material, rash guards promote blood flow and recovery time which is vital to keeping your muscles healthy. Unlike other rash guards that soak up sweat, moisture is wicked away keeping you dry so you can perform with confidence. The long torso cut reduces roll up whether you're doing MMA or bag-work and the anatomic fight fit molds to your body shape. The super-stretch material with 4x4 nylon flat stitched seams, provides comfort and full range of motion when wrestling, grappling or doing Brazilian jiu jitsu. Sublimated graphics are permanent and will not crack, peel or irritate your skin. If you're training or competing in combat sports or martial arts, you'll love the anatomic fight fit. In addition to this rash guard in black, we offer the product in red and blue as well! If you have any questions, please call our experts at 800-767-8288 or message us online. 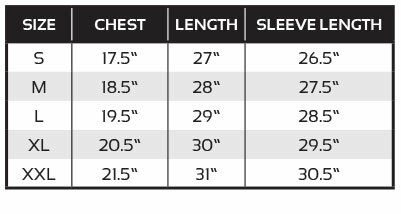 Order The Shield long sleeve rash guard from Revgear today!